This is a pillow I have been working on. It's one of those projects that has been sitting on my ironing board in pieces ready to sew but just never quite making it to the sewing machine--until tonight! Please tell me that you too have projects in pieces just waiting in line to be finished..............PIPs (projects in progress). 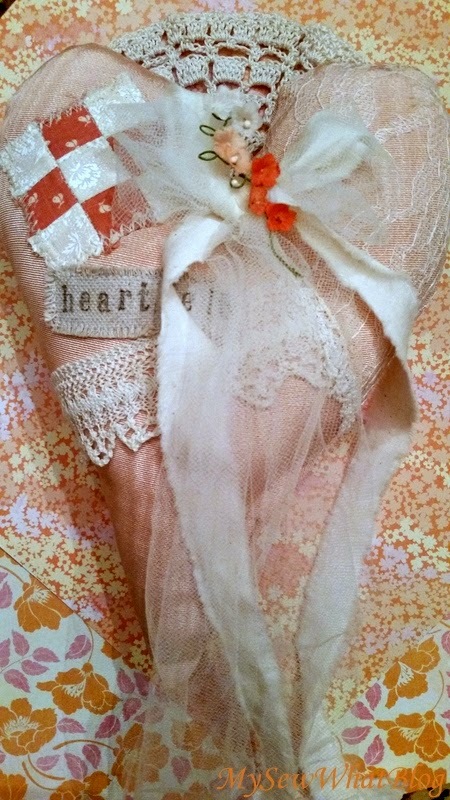 This heart pillow has some lace, some of which is vintage. The fabric is also a vintage moire taffeta in a pale peach. You may recall that I made some slippers from this fabric a while ago too. 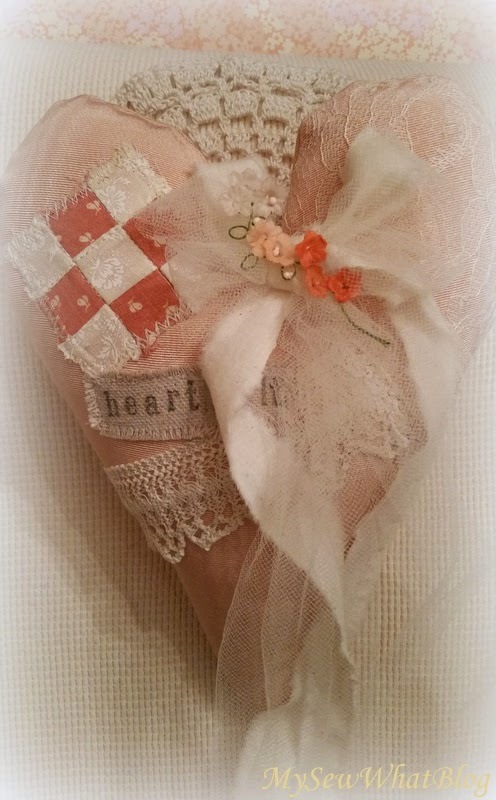 I love making heart pillows and have given them as gifts. I have a few of my own that I have hung as ornaments or used as pincushions. This one has a bit more detail on it. I made a shabby 9 patch (faux) quilted patch, and even put in some random stitches to make it appear quilted. I love tiny details and love to include these little touches in my work. 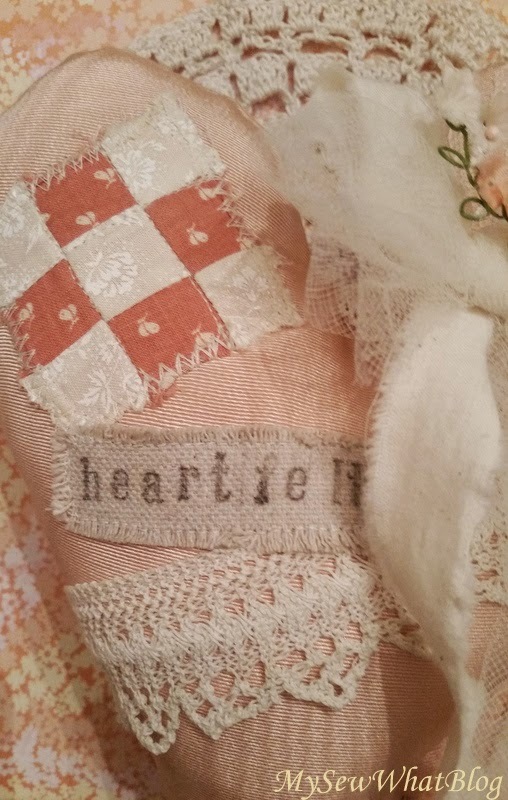 "Heartfelt" is hand stamped onto a piece of fabric, frayed and stitched in place for some additional shabby appeal. I hope to have several of these in my ETSY shop soon. fabrics to work with. It lends such a lovely, delicate, romantic touch to the pillow. I use tulle on lots of sewing and craft projects and it makes the prettiest bows on wedding and shower gifts. I keep a couple of yards in white and ivory on hand at all times. 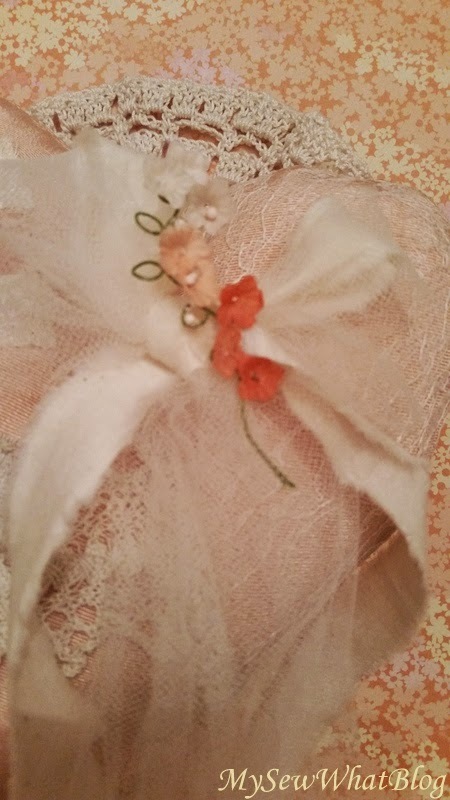 I love the little spray of vintage flowers in ivory, peach and pale peach. What inspired me to finish my heart pillow this evening? Well, this morning one of my blogging friends (Diane from Lavender Dreams) emailed me to let me know she had featured me on her most recent blog post. Some time ago, I made her a heart pillow after she left me a very sweet comment under a post about another pillow I had made. So I made one for her and mailed it off to Florida! How nice to see how she has been displaying it in her home. Click here to read Diane's post. It put a smile on my face! Her post is entitled "Beautiful Friendships". She is referring to all of the wonderful friendships that she has made while blogging over the years. I know exactly what she means as I have met some of the loveliest ladies in blogland myself. We share daily or weekly details of our busy lives with one another and soon it just starts to feel like a conversation among dear friends. I could sit down and chat with many of these ladies over coffee and tea and feel completely comfortable-- as though I have known them for years. Diane and I stay in touch weekly, sometimes daily and I always look forward to hearing from her. If I am away from my blog for too long, Diane will email me and make sure everything is alright. I check in on her as well. 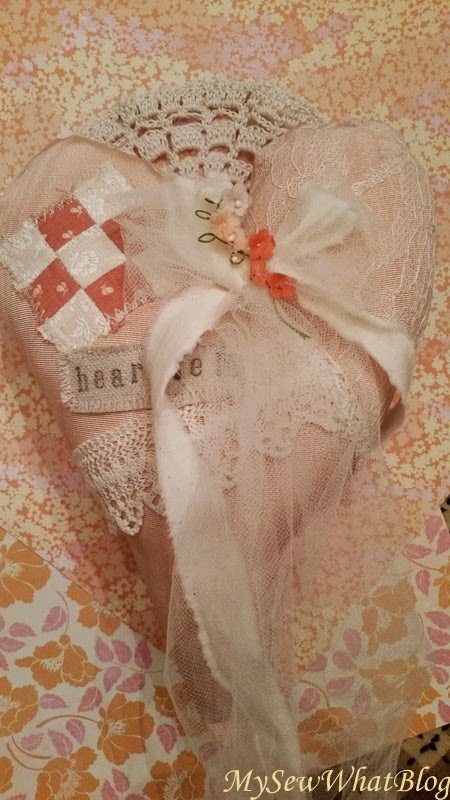 So tonight I was inspired by my friend to finish this little heart pillow. She gave me an unintentional nudge that I absolutely needed and I am grateful. Many thanks for your your very sweet and timely post Diane. Heartfelt thanks! Now to tackle all those other projects in pieces! Where did I go..... just when I thought I could not take one more minute of winter snow or ice? We drove about two and a half hours north to view mountainous piles of snow and ice! BUT it was worth the drive and even the walk in some pretty cold temperatures. I took these photos with my phone. 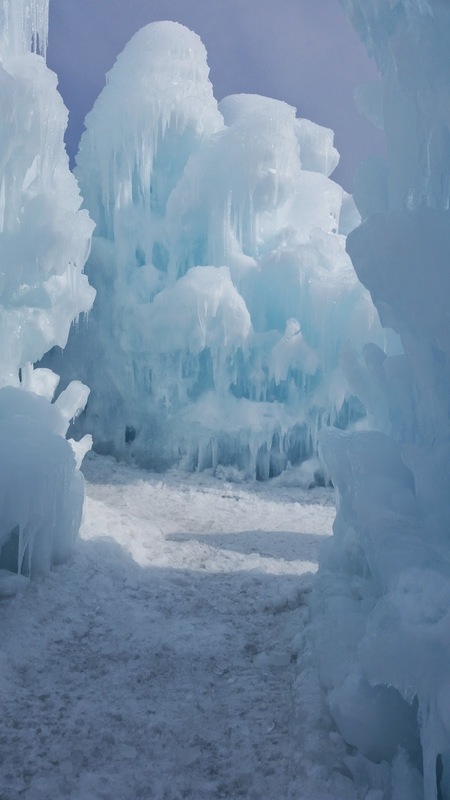 We were at the Ice Castles in Lincoln, NH. 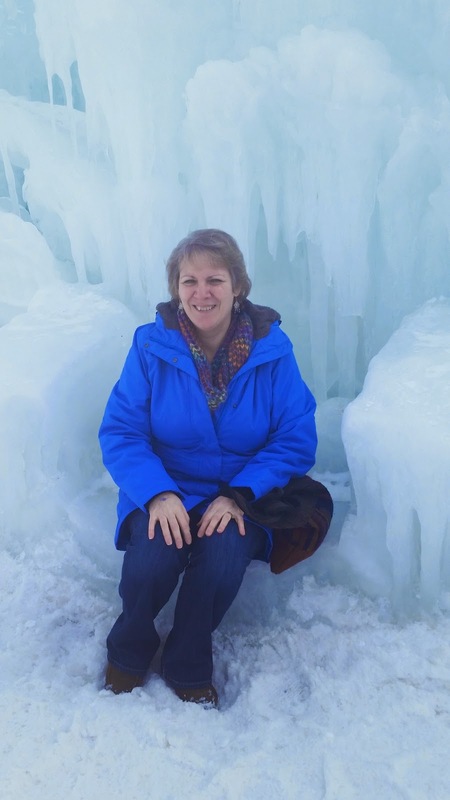 It is a beautiful area and Lincoln is of our favorite places to go in the "North Country." 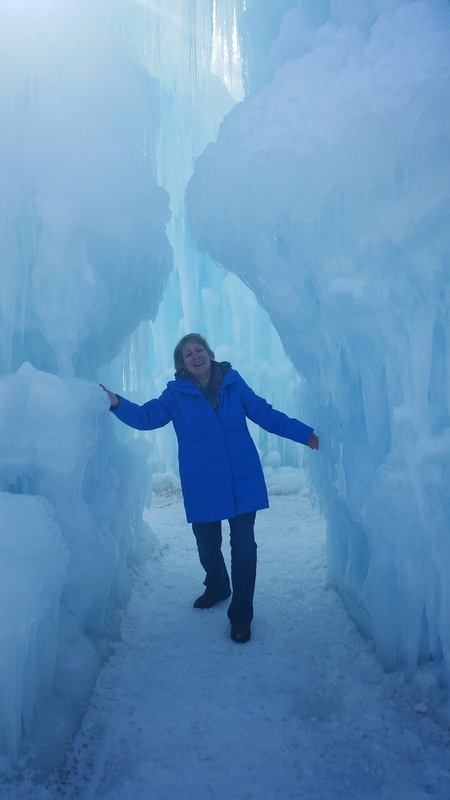 Though it is near the end of the season for these Ice Castles in NH, they were still a magnificent sight and I was totally captivated by the beautiful ice formations as we walked around. There was some rather dramatic music playing which added a nice touch to our tour. You can imagine my camera clicking away.....there was something to photograph in every nook and cranny. The sky was a greyish blue but there was plenty of sunshine too so the combination of light and sky made for some interesting backdrops in these photos. In these next few photos, the sky appears to be in various shades of periwinkle. It really was very beautiful! 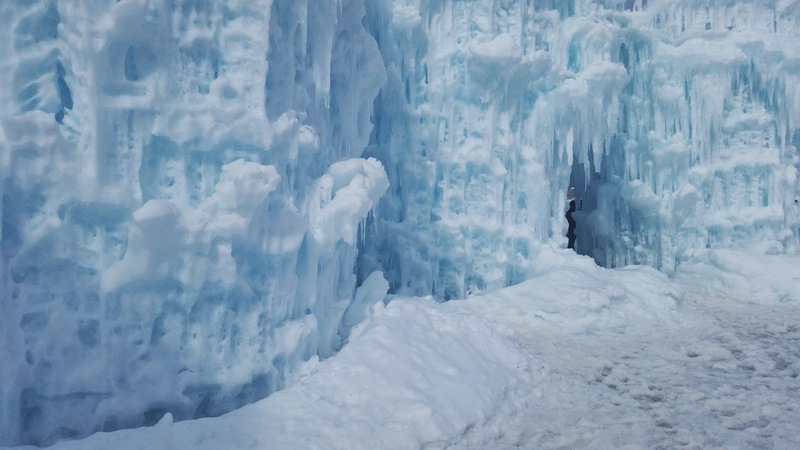 I swear the larger ice structure in the photo above has a face! I can see it, can you? 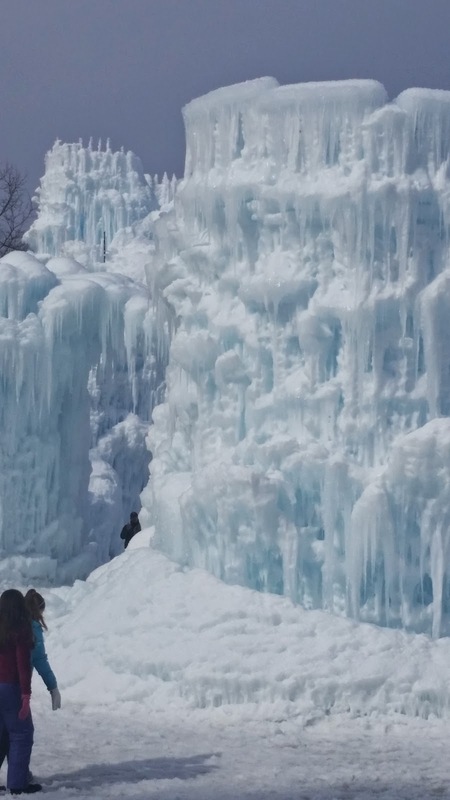 This tower of ice reminded me of the mountain in The Grinch movie! See below too! We went on a weekday and it was mid afternoon, so there were not any crowds. 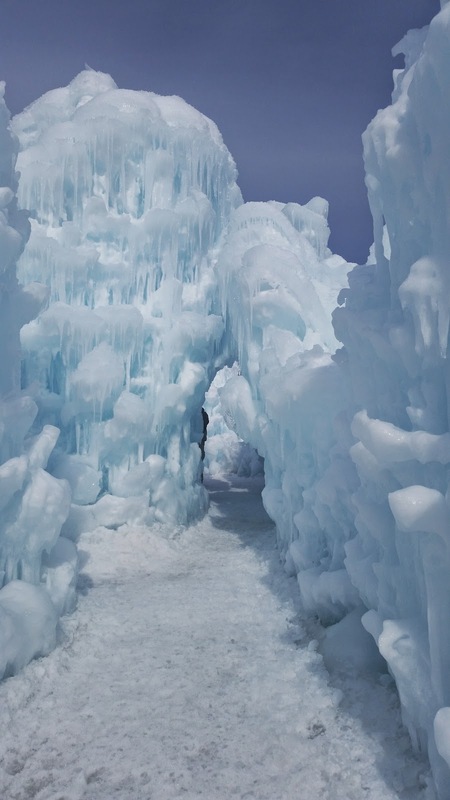 I have heard that it can get quite crowded and it must be difficult to get any photos of the ice structures without people in them. I was glad that I was able to get quite a few without people standing in front of them or walking through. This cave was pretty amazing though the photo above is a bit blurry. 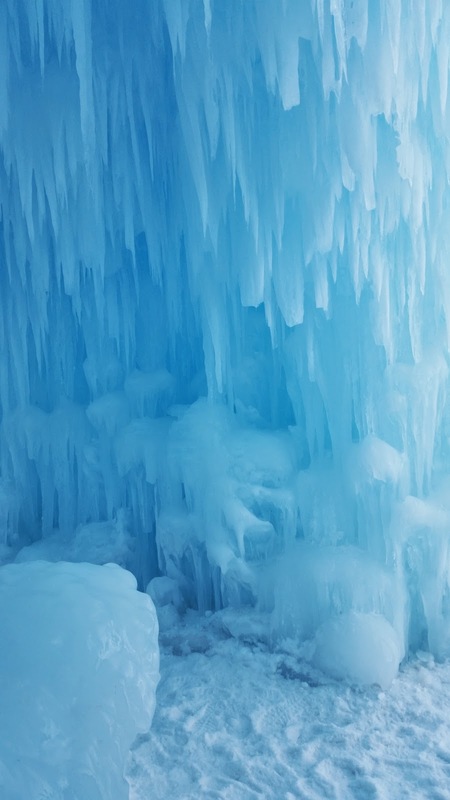 I would not want to have one of these icicles fall on my head! They were enormous and they looked sharp! 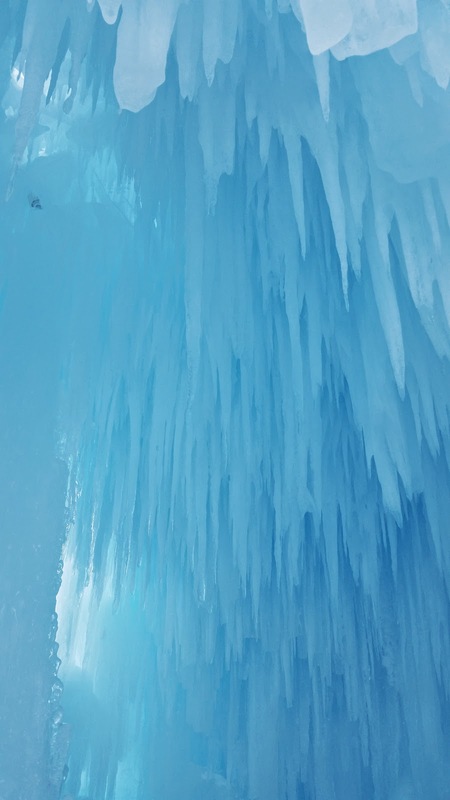 It looked like a gigantic tree of icicles. Looking up, it was so beautiful! 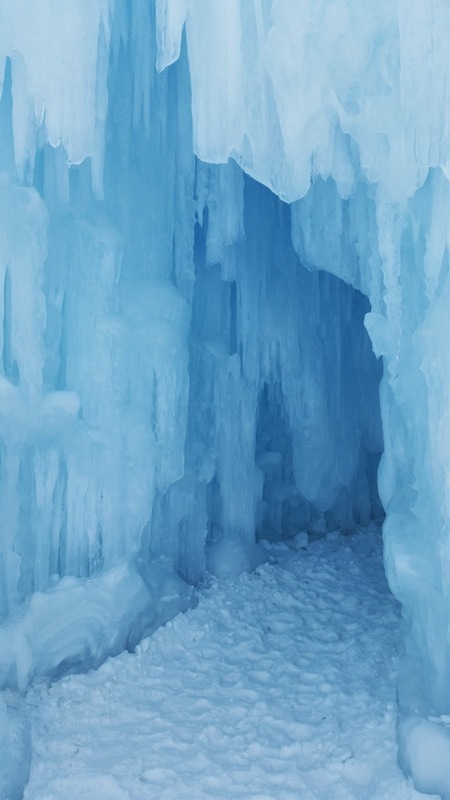 Just outside the cave full of icicles was a chair made from ice. I sat for a moment--a brief moment! I am used to a heated seat! OK! I admit it! I went there and I sang that song! Let it go! 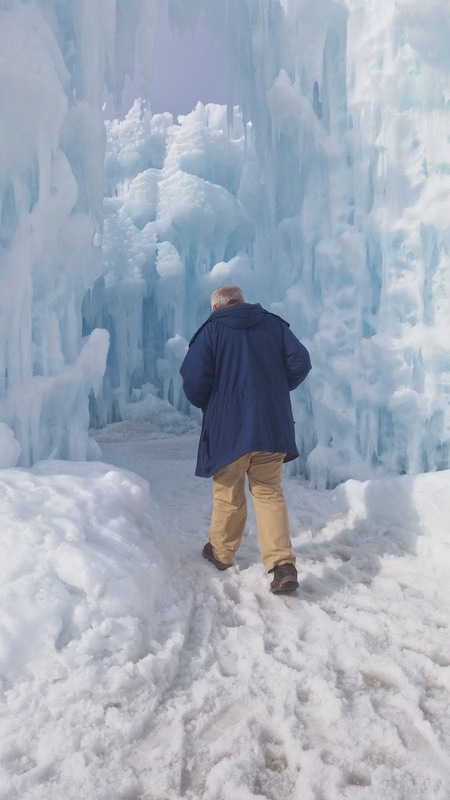 Here my husband is heading into another ice cave. We walked through all of the caves and castles at least three times. I really wanted to view them in the evening when they use beautiful colored lights but we didn't really want to drive all that way back in the dark. We also had some shopping to do at some outlets on the way home. So we left but decided we would come again next year during peak season and stay the night. 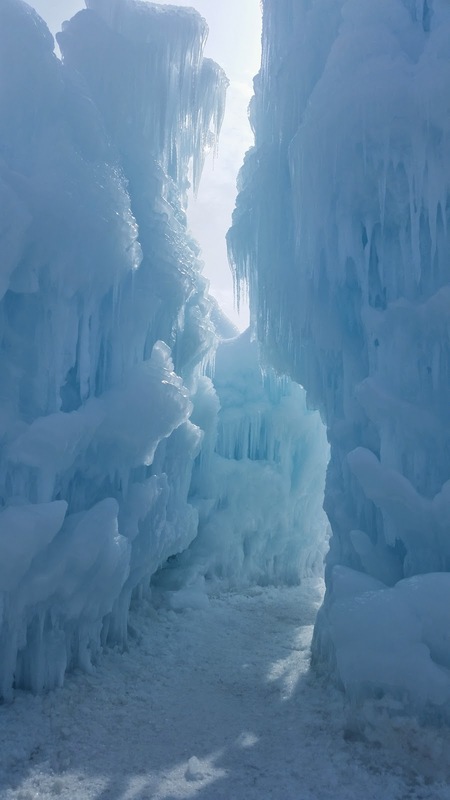 Don't you just want to walk through the entrance to this ice cave? My hands were frozen because I was not wearing gloves. The sunlight made the screen on my phone so dark that I could not see what I was photographing. There were times when I wasn't even sure if my phone was in camera mode...... I am lucky that I got any photos at all. As we were walking back to the parking lot a family was getting out of their car. 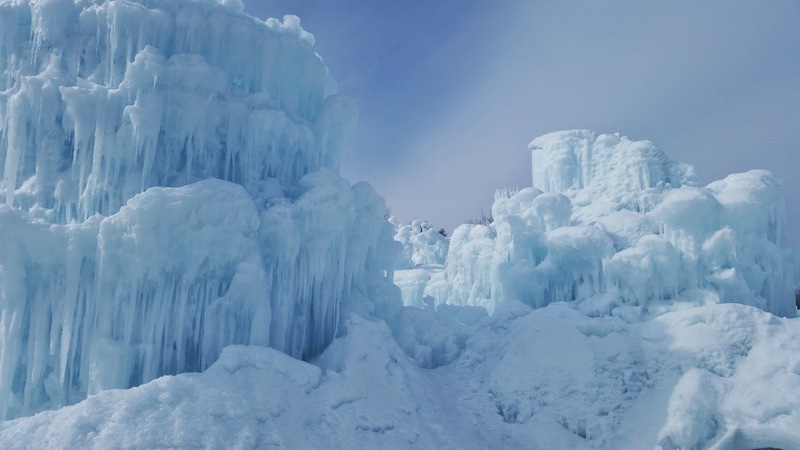 A little tiny girl, perhaps two or three years old was dressed in full Elsa attire and was just mesmerized by the sight of the ice castles! How magical for that little girl and for all of the kids (and kids at heart!) lucky enough to catch this sight! 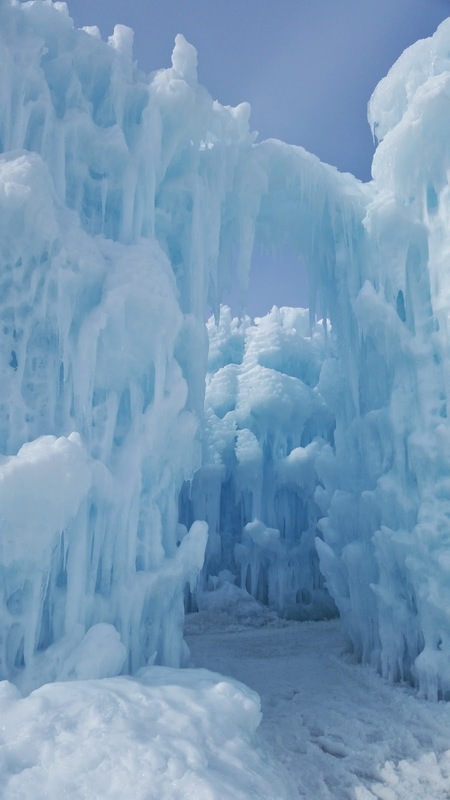 For more information, locations of ice castles closest to you and a view of photos that are far superior to mine, CLICK HERE! 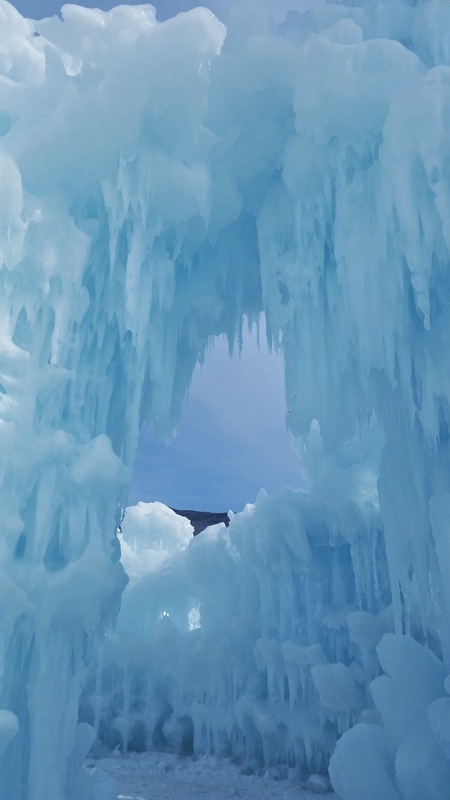 If you click on the link HISTORY at the site there are three videos that can be viewed that were filmed in the ice castles. 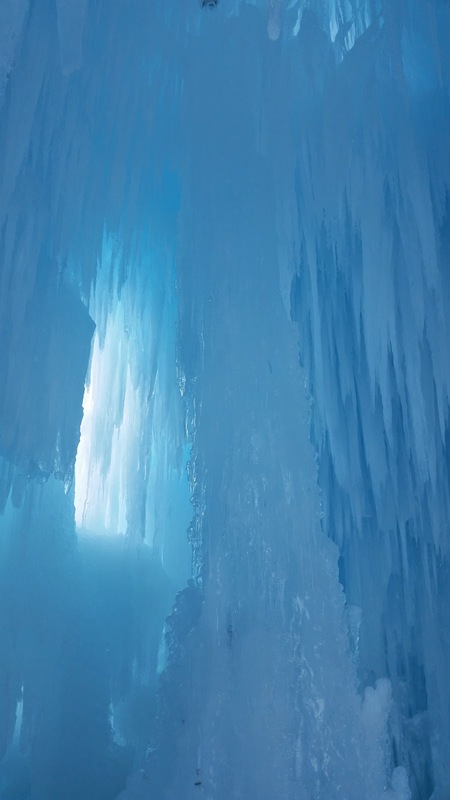 If you have not seen the version of LET IT GO (with a children's choir singing in the ice castles) it is worth the view. The young lady featured and singing in the video has an amazing voice! I think it's my favorite version and I have heard many.